It is possible to avoid a shaky hand every now and then when you are using your bow and arrow. If you have shaky hands, then it is wise to invest in a bow stabilizer. This extended piece of equipment is a valuable component to have, as it can help keep your bow straight, balanced, and ready to shoot. Gain a sharper, more precise, and steady hand. Using a bow stabilizer will increase the chances of your arrow hitting your target. Smack dab in the center. Below, we will teach you how to choose the best bow stabilizer on the market in 2019. How To Choose The Best Stabilizer? 1. What does a stabilizer do? 2. How Does A Bow Stabilizer Work? 3. How To Balance A Bow With A Stabilizer And Make A Quiet Shoot? 6. What Length Stabilizer Is Good For Hunting and Target Shooting? There is a lot entailed when you choose a bow stabilizer. There should be plenty of thought and considerations that go into weighing your decisions when it comes time to buy a bow stabilizer. Being one with nature is a way of life and so is a stable bow. When you start to stabilize your bow and arrow, your shots will be that much cleaner and straight to the point. Before you buy the best bow stabilizer, you need to consider the stabilizers, weight, length, noise reduction, size, customization, does it come with a warranty? Questions like these are crucial when it comes to finding the best one that suits your own specific needs. The weight of your equipment can have a detrimental effect on your bow and arrow performance. If your bow stabilizer weighs too much, then it could affect your shot, this would ruin a bullseye. You need to purchase a stabilizer that is lightweight and allows you to maintain your flexibility. The length of your bow stabilizer matters, if your stabilizer is too long then you will be sidetracked and cause interference. This will take away from your focus and concentration. As we know, these skills are highly needed in archery if you want to keep moving up in levels. The good thing about stabilizers is that you can specifically customize your equipment according to your personal preference. If you want to find a stabilizer that offers wind resistance, noise reduction, along with vibration control than you have the ability to find a custom-made stabilizer as there are many different ones on the market that have proven to be successful. Having a warranty on your bow stabilizer is one of the smartest decisions you can make. We all know that insurance matters, you may not think about it now, in the present, but when something happens to your stabilizer, it would be in your best interest to purchase insurance. After all, you will be spending your money on this extra bow component, so you’d better ensure yourself by only buying a stabilizer with a warranty. Protect yourself from an unfortunate circumstance. When you are looking for a bow stabilizer, two of the most important aspects you need to worry about is, vibration and noise reduction. All hunters know, if a deer hears vibration and any noise, the deer will be long gone, way before you are able to hit your target. This is where bow stabilizers come into play. Stabilizers provide a dampening ability, they reduce the sound vibrations of the bowstring once it is slung. The way it works, each stabilizer is built with material that is equipped to dampen this unwanted effect— vibration and noise. 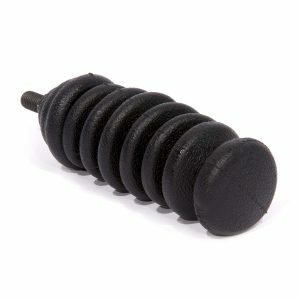 The dampening material is usually made of rubber. After you shoot your bow and arrow, vibrations and sound pass through the stabilizer, the bowstring then snaps back at your hand, also known as bow torque, creating pressure on your hand, especially if you don’t have a stabilizer. Think of this technique as ‘masking’ the sound and vibrations. Obtain a quieter shot, lessen vibrations, hit consistent targets, and protect your hand with the right bow stabilizer. You can choose your color, pink or camouflage. If you are the hunter type, then we suggest that you go with the camouflage look for purposes of blending in. Otherwise, if you fancy the color pink, get it, but don’t expect to be hidden. Unknown animals in the wilderness are always smarter than you think. With this bow stabilizer, you can aim and strike your target with complete accuracy. This stabilizer has a track record of helping pros hit all of their targets with absolute precision. The weight can be adjusted and the build is meant to last. 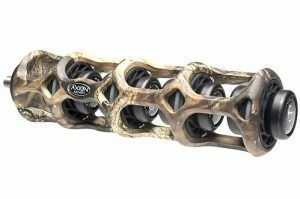 This stabilizer is built with high-quality materials and certainly adds more balance to all bow’s. If you are looking for a clean shot, this stabilizer is ideal because it can help teach you consistency. We recommend that you use a stabilizer until you have mastered archery. Some pros can go without additional pieces of equipment added to their bows, but it is best to practice accuracy with a stabilizer that works, this one definitely weighs in. Remember, slow and steady always wins over fast and sloppy. Being that this small piece of equipment is so light, there will be nothing weighing you down on the trail— if you choose to purchase this stabilizer. Whether you are a pro or not, this will help propel your arrows straight into the bullseye. This bow stabilizer comes in all sorts of colors, from pink to blue, you name it, you got it, although it does not come in camouflage, which basically defeats the whole purpose if you are hunting. Of course, us hunters never want to be noticed. In our opinion, this stabilizer is for the archery lovers who want to eventually go pro. You will gain complete stabilization, vibration will be dimmed down as soon as you release your arrow, causing it to flow straight and clean with no extra vibration. The stabilizer weights each weigh 1 oz. It is true when you are in an archery tournament, one shot can achieve wins and one shot can break you. If you want to pin your mark with a fast arrow, this stabilizer offers a light balance along with an adjustable fit. It is not hard to mount this onto your bow, in fact, the setup is efficient with this brand. When it comes to balance, you need to have just the right amount of weight. Keep in mind, some stabilizers are too heavy or too light. If you do decide to take this stabilizer with you on the beautiful fields, it won’t weigh your pack down and it can prove to be entirely valuable for those long deer shots ahead of you. Just because the Bee Stinger does not offer a camouflage design, you should not be deterred from buying this type of stabilizer. You can solve this by choosing an earthly color. Take this weightless stabilizer with you inside of your pack and soon you will be consistently hitting all the targets you set out to hit. The EBBQ was made to reduce wind and resistance by at least 80 percent and eliminates the phenomenon of bow torque, (your hand pain will thank you if you decide to choose this bow stabilizer). The entire weight of this product totals 8 oz. Keep in mind, the wind can affect your shot tremendously. With this added component, the wind will not have an advantage. This product was manufactured with a high-quality CNC machined design and hollow frame that is able to divert the wind. Pair this with your medium to lightweight bow and soon your stability and consistency will move straight forward. For under one hundred dollars, archery enthusiasts are improving their archery shots. This product is 6 inches in length, which isn’t too large to lug around all day. Four separate dampeners are included, they reduce noise and wind. The extra dampeners that are included help minimize sound and vibration, making this stabilizer a reliable resource for hunters all around. Eliminate deer escaping your target. If you happen to be a material lover, then this type of stabilizer may be your best choice, as it offers a very sturdy type of material—carbon-fiber along with rubber. The price is very affordable. The NAP Apache makes sure to quiet any sound that comes from your bow after the pullback, it also helps stabilize your bowstrings once it is released and torques back. This product weighs 8 oz. If you are planning to shoot far into the distance, past 40 yards, then having this stabilizer is an absolute must. The material that is used for this product is high-end and weatherproof. The noise and vibration reduction this offers is quiet for hunters. The NAP Apache has a reputation for hitting deer on target, this is why hunters love this version. This is a universal bow stabilizer, meaning it will fit on any favorite bow that you use. The NAP Apache is bound to silence your bow right after you shoot. This unique bow stabilizer is as modern as they come, there is an array of colors to choose from, pink to green or red to purple, choose your favorite color. 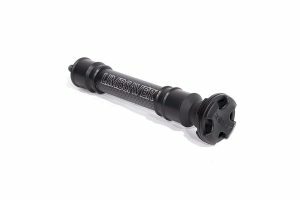 The LimbSaver is a very lightweight stabilizer that has an aerodynamic spiral with an s-coil design, enabling you to minimize all vibrations in order to hit your target spot on! We recommend this product for hunters, newcomers, and for intermediate archery players, as it is easy to install on any type of bow. With the s-coil build, the usual bow jump is reduced, by independently canceling the shock. The manufacturer provides NAVCOM material, this will dampen unwanted noise and vibration. When it comes to obtaining a smoother and quieter shot, you will notice the difference when you use this uniquely designed, hand-made brand, designed in the USA. LimbSaver is known for manufacturing products for hunters, outdoorsy types, law enforcement officers, military personnel, and more. The SAS design uses an aluminum material, which is known to be sturdy and long-lasting. The build blocks extreme vibration and weighs 5 oz. If you are looking to gain long-range momentum and you are trying to avoid extreme vibration than the SAS will be your top pick. You never have to worry about the SAS stabilizer coming undone while you are on the field or on the spot during an archery tournament. You can easily store this product in your bag without any interference from other equipment. You can choose to buy the camouflage or the jet black version, no additional colors are included. If you are looking for a full draw and counterbalance, this stabilizer offers just that. Hunters who want to hit targets with no fuss, we recommend that you choose the SAS Archery. The length is longer than most other stabilizers on the list, so if you are looking for pieces that are more compact, this product will not be for you. This stabilizer looks similar to a bone artifact. The equipment piece blends into the terrain, allowing you full camouflage capabilities. This brand is made of molded rubber, has dampening fins, and is meant to minimize noises and all vibrations. The Truglo is built for hunting bows. The great thing about this product is that it is meant to fit all different types of bow’s, making this product universal. The product weighs a total of 4 oz. If you want to improve your stabilization and your performance, choosing this stabilizer works beyond measure. If you already have enough equipment to carry, then utilizing this small piece of vital equipment will not only aide your aim, but it will cause you less strife when you are later complaining about how sore your back is. You won’t have this stabilizer to blame. The weight is so light, you will forget you have this essential tool strapped inside of your pack. Note* You should always delegate one spot for your equipment and tools inside of your pack, so you don’t accidentally lose your gear and then come back later to find it. The Truglo can help you win a tournament or kill plenty of deer. Certainly do not overlook this important component, simply because it is too small (4.6 inches), you need to look at the bigger picture. This stabilizer has a reputation for being dynamic. All vibrations that pass through this stabilizer encounter a smooth type of feeling, right after you sling your arrow into far away distances. Your bow will become entirely stabilized with the S-Coil Bow Stabilizer, in turn, this will reduce the jump of your bow, leaving you and your physical stance in full control. This product is easy to install and can be done quickly, at a moments notice. The item survives in harsh weather and limits any unwanted noise that may arise from the pullback of your bowstring. For such a small size, this stabilizer provides an array of different features. Neatly pack this piece of equipment into your archery or hunting gear bag and soon your targets will hit exactly where you want them to. This product is not our favorite on the list, for the fact, the paint is known to chip off easily, especially if you rough it out with this piece of equipment. Being an equipment babysitter is never fun! 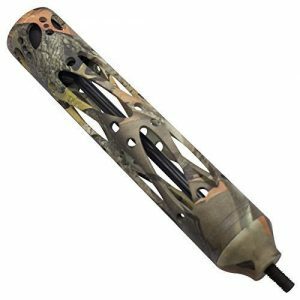 You are better off using this stabilizer when you are practicing for a tournament because if you were to use it while you are in the wild fields, you might injure the exterior appearance. Obtain a precise design made from aluminum with FlyArchery. This stabilizer was made by engineers who used innovative technology and advanced features to reduce wind, vibration, and noise. This product is available in various sizes, length and weight may vary. The FlyArchery design follows suit and provides a nice camouflage appeal for all hunter enthusiasts, you will continue to blend in, as long as you choose this type of style. The vibration and noise reduction this product allows is extreme. Although, the aluminum design will never be as good as carbon-fiber and rubber material. This design will need to be screwed in directly to your bow. Now here’s a unique stabilizer that offers optimal rigidity with a Tri-Foil shape. A carbon-fiber rod is used to provide aerodynamic capabilities to improve arrow accuracy and decrease vibration. It is inevitable, vibration can change the ending outcome of your target. If you tweak your bow to perform to the best of its ability, then you are not only enabling your bow with stabilization, but you are aiding yourself to achieve future archery and hunting perfection. Practice always makes perfect, do not forget this encouraging piece of advice, every time you miss and hit your target. Your performance will be improved if you elect to get this stabilizer, as the Tru-Foil shape allows this item to block oncoming wind flow and reduce bow torque. The noise will also be reduced with this version. If you are looking for a trustworthy stabilizer that you can keep for years, with zero issues, then this one has a reliable reputation and provides a durable backbone. 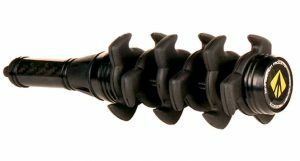 If you are on the prowl for a small and black stabilizer than this is your go-to tool. You can manually fix and adjust the weights to provide immaculate and accurate balance. We recommend this stabilizer for the professionals, as the newbies may be a bit confused when it comes to adjusting the custom designed balance weights. Two colors are offered with this version, black and fluorescent green. 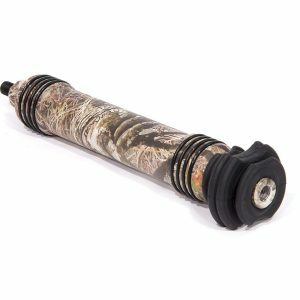 This particular stabilizer is ideal for an archery tournament opposed to a day of hunting, for the mere reason that a camouflage design is unavailable. 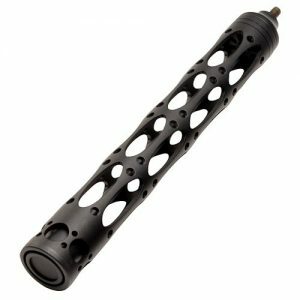 The 30-60 offers the same features all of the other stabilizers on this list offer, although this is a fairly new product on the market. All archery enthusiasts look for absolute precision. The aluminum build this bow stabilizer offers is just as good as the other aluminum-based stabilizers on this list. The 30-60 is not exactly our favorite on the list. Although this product is very affordable, we recommend this type of stabilizer to newbies, this way, if the newcomer doesn’t want to take up the sport of archery or hunting for the long haul, no one will be wasting their hard earned money. Wind always interrupts our daily lives, no matter what we are doing, the wind is annoying. It is even more bothersome if it ruins our targets when we are in an archery tournament. This product is meant to be used outdoors and can handle many different types of weather conditions. The greatest feature this product offers is its ability to control wind at the capacity it does. Your target will not go off track with this stabilizer, it is accurate. The LimberSaver is 7-inches in full length. If there was a stabilizer meant to keep things entirely quiet than this one should be starred. This product is made of top quality carbon-fiber material that limits all vibrations and protects your hands from the backlash of the bow’s string once you sling your arrow. The LimberSaver is so easy to use, you don’t need to peek at the instructions, (although, we do advise that you read the instructions to get acquainted with all of the products you buy). If you are planning on being out on the field for days on end and don’t want to be carrying around large equipment, then we highly suggest that you consider bringing a 4-inch stabilizer with you over a 7-inch, as long as they have the same qualities/features. We consider this stabilizer to have first-class craftsmanship, as the designer made sure to build this with comfort and reliability. 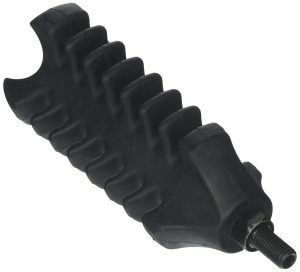 If the size is not a deal breaker for you, then this stabilizer will help you tighten your grip and your target. Treat your target aim with care by purchasing this well-known stabilizer that minimizes your misses. This product is 7-inches in size and is made of aluminum (6061 machined aircraft) material, the WindJammer edition is meant to increase your shot consistency. When it comes to dampening external vibrations, this stabilizer blocks the wind, hence the product title—WindJammer. Of course, perfect summer days are always ideal when shooting archery or hunting, but as you know, the weather will remain precarious. Preparing and equipping yourself for the unexpected always puts you ahead of the game. As an archery sports enthusiast and hunter, you of all people should know that bad weather is sometimes unavoidable. You could have the best stabilizer on the market (note* every opinion is subjective), but if you are not good at aiming or you lack the other skills that go along with archery and hunting, such as concentration, focus, good eyesight, good form, and arm strength, then you will be limited at achieving a high success rate of hitting every single target. If you are on the prowl for a stabilizer that is 100% carbon-coated, with an 8-inch bar in length and weighs 4 oz., then look no further than the Bee Stinger. This stabilizer offers dynamic features. More unique features include an engineered Moment of Inertia (MOI), this helps control the bow torque and ensures the bow’s string does not ferociously vibrate. A SIMS De-resonator along with shot control, help place you in the number one archery position before you know it. The build of this design includes stainless-steel mounting bolts that help you easily mount this product onto all bow’s—yes, it is universal. Carbon is proven to work—it is lightweight. Improve your archery game with extra balance, usually, you can’t obtain this kind of balance if you don’t have an accessible stabilizer. If you are looking for material that lasts, along with adjustable weights, and an easy mount, this stabilizer is meant for you, if you want to go pro, that is. A lightweight product that helps with balancing and outlasts most other bow stabilizers on the market. If you are wanting to call yourself an archery champion than you might look to getting this Shock Stop Stabilizer to eradicate your shaky hand syndrome. This stabilizer is known to help many professional archery players win trophies, this is why the title of the product suits this item perfectly—Trophy Ridge. The weight of this stabilizer helps keep your bow balanced just right and ready to shoot. The shock absorber allows for a clean bounce back, providing ultimate comfort for the hand that holds your bow. Sometimes, all it takes is an extra accessory to improve your overall game and skill in archery. This item is sure to bring a solid feel along with a cost-effective price. The Trophy Ridge absorbs almost all vibration after you’ve slung out your arrow to its target destination. This item is sold in black. At first, you may wonder whether or not this stabilizer will fit into your pack, but no need to worry, because it will. This bow stabilizer accessory is relevant for complete accuracy. If you are a pro or a beginner, the Trophy Ridge is meant for you, well, as long as you enjoy actual trophies and winning. A stabilizer is meant to provide you with a steady bow and arrow support. Our hands and bodies are not completely still unless we have complete focus (even then they are not entirely still), when we hold a bow and sling the bowstring back hard, a stabilizer helps keep the bow stabilized, vibration-free, noise reduced, and ready to aim and shoot. A bow stabilizer does more than improve accuracy, a stabilizer also protects your hand, by lessening the impact of the vibration via the bowstring, after the shot is complete. A stabilizer works by minimizing bow torque, noise, and vibration. Basically, as you pull the bow’s string and release, it will bounce back, this will create noise and vibration, all of which, may affect the ending outcome of your arrow hitting its target. The stabilizer needs to be mounted onto the bow, usually by screwing it into your bow (make sure your bow is built for this added component). First, you need to mount your stabilizer on your bow. Next, adjust your stabilizer onto your bow according to the directions. Most likely, you will need to securely screw your stabilizer into your bow. Once you do this, add dampeners to your stabilizer and adjust the custom weights that are included, this will help the sound vibrations pass through the rubber dampeners, masking sound and vibrations. Note* Always be sure to test your equipment before you start out on your archery adventure of hunting or participating in a tournament. As mentioned, faulty equipment can ruin your next shot! Many hunters can agree that 8-10-inch stabilizers are usually effective. As long as the dampening material is rubber, vibrations and sound can be stopped dead in their tracks. Any stabilizer longer than 12 inches is limited by the National Field Archery Association; this is an important fact that can dictate what type and size of stabilizer you buy—if you are entering in archery tournaments. For the purpose of archery, 2-30-inch stabilizers will be appropriate, the longer and heavier, the better. Past 12-inches doesn’t adhere to the NFAA guidelines if you are participating in an archery tournament. 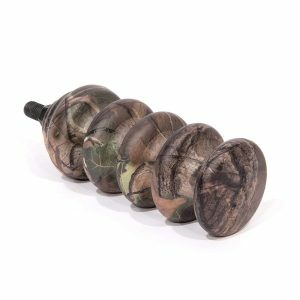 If you are not in a tournament and you are buying a stabilizer for hunting purposes, 1-6-inches will be ideal, you also want to pick one that is lightweight. It is important to test out and research a few stabilizers until you decide which size fits your needs. LimbSaver= Made in the USA, produces the HD S-Coil Bow Stabilizer, 4-1/2 Inches and provides high-quality products for expert hunters and newbies all around. This company is known for their s-coil stabilizer built with innovative NAVCOM technology. EBBQ Axion=Is known for its CNC machined design that reduces 80% of wind. The brand EBBQ Axion is well-known for their Mathews harmonic dampers and makes the SSG Silencer Stabilizer. 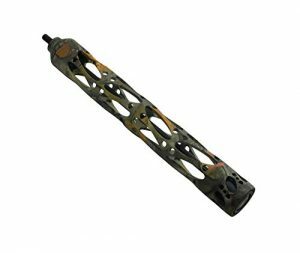 NAP Apache Bow Stabilizer 8” Carbon-Fiber and Rubber made by New Archery Products= Is known all over for its lightweight carbon-fiber and rubber build. The NAP Apache keeps things simple yet effective. The Bee Stinger brand produces the Pro Hunter Maxx Stabilizer, 8-Inch Matte Black, and is known to create archery trophy winners all around. This brand creates a uniquely customized weight at the end of the stabilizer. Of course, the best bow stabilizer brands topic is subjective, especially when it becomes a professional archery and hunting topic. As mentioned, for hunting, buying a stabilizer that is shorter in length and allows you to maintain your ongoing flexibility is a wise decision. Usually, archery pros prefer larger stabilizers because they are not trekking through forests and do not have to move quickly through wild terrain. An archer will be better off choosing a larger and heavier stabilizer. Hunters need to carry little equipment when they are out on the field. The equipment utilized needs to be made with good craftsmanship; do not overlook honest reviews. Archer target shooting is a whole new ballgame. The archer pros do not have to think about holding less equipment, their sole goal is to balance, aim, and hit the center. This is the same for hunters, although hunters need to be on the move with the lightest equipment possible. Sometimes buying pricey sports equipment can drain our wallets. We can’t always spend large sums of money on archery and hunting gear. We must always provide for our households first and make sure everyone is well taken care of. If you simply don’t have the means to invest in a bow stabilizer, you are in luck. For those of you who simply want to try making your own bow stabilizer from scratch, then you are in the right place. Below are the steps needed to make your own bow stabilizers. Measure your lightweight pipe, determine how you want to cut it. Now saw off any extra measurements that you do not want. Prepare your end PBC caps, be prepared to place these at the ends of your pipe that you just sawed on each end of your lightweight pipe. Drill a hole through the PBC end caps for a bolt to go through as a bottom cap. Make sure the bolt is snug and tight in the end cap. Put aside. Use rubber rings, add these to your hollow pipe. Now place the bolted end caps into the end holes on your pipe. The end caps should close the (2) hollow openings. Now, add the last end cap to your hollow pipe, it should fit snug and tight. The last step is solely for appearance purpose, add Plasti Dip to your hollow pipe (your new bow stabilizer), now paint black. Knowing this valuable skill will enable you to always to hit your targets wherever you are, through accuracy and control. Controlling vibration may seem minuscule, but as we’ve learned, its possible for your arrow to be swayed by the slightest sound or vibration. If you don’t have a stabilizer—remember you can always build one, we highly advise watching videos to gain a visual. Sometimes doing-it-yourself can save you hundreds of dollars, all it takes is your time, effort, and informational knowledge. 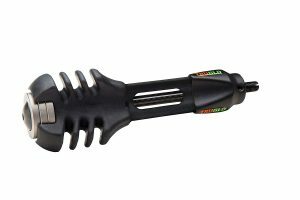 In our opinion, a universal bow stabilizer for hunters and archers would be the Truglo Deadenator Xs Stabilizer, it offers a comfortable feel with Tru Touch technology, is lightweight, and provides noise and vibration reduction capabilities that work. If you don’t like carrying heavy things (it’s not good for you back), this works. When it comes to professional archery and hunting, being a professional versus not can come down to having a stabilizer or not. The entire goal is to hit your target with complete accuracy. If a bow stabilizer helps you achieve this mission than it is a wise decision to invest in a stabilizer, after all. Focus, balance, now steady, stable, and shoot!